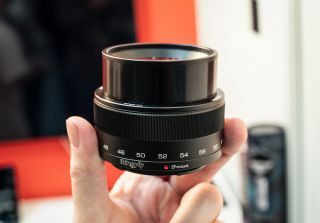 Thingyfy chose The Photography Show to debut the Pinhole Pro X 18-36mm – the world's first ever pinhole zoom lens, which bolsters its line-up of professional pinhole primes. "Adding the zoom, obviously because the pinhole is such a small aperture, if the focal length is too long and you have a finite diameter, that basically means that you could have a very pronounced vignette – sometimes it could even create a tunnel effect, like dark corners," Boz Zou, CEO of Thingyfy, told us regarding the challenges of adding a zoom to pinhole technology. "With the DSLR version the diameter is enlarged little bit from the original one, just to accommodate the longer focus. So we really have worked very hard with every single camera mount to ensure that the ultra-wide range is very safe – especially for the DSLR, we don’t want the pinhole to get too close to the mirror, so that’s been fully tested. At the same time we want to make sure the longest focal length doesn’t have dark corners. So that takes a lot of engineering and a lot of testing as well to create that." "People use the lenses to create music videos as well," says Zou. "We’ve sold quite a lot of our lenses especially to artists, and a lot of them are musicians, and they love our lenses because you can film and without any editing it matches with their music [due to the authentic, 8mm-like film quality]." "Most of the people just do pinhole on the cap, which is more of a DIY stuff, so it wasn’t very precise; the image sometimes was blurry. What we’ve done is use state-of-the-art CNC technology with a 120,000 rpm microdrill. The smallest pinhole that we have here is 0.1mm, and the precision is 0.02mm – that’s the kind of precision that we’re talking about. We have our own manufacturing base in Asia, so all of the lenses you see here, they’re all CNC machined – industrial robotics are working on those." We took some test shots with an early prototype of the new lens and we're incredibly excited to get a production model in our hands. The Pinhole Pro X 18-36mm will be released in April "for the same price as the Pinhole Pro X", which currently sells for $89 on the Thingyfy website. Mounts supported by the Thingyfy range are Nikon F, Sony A, Sony E, Fujifilm X, Pentax K, Micro Four Thirds and Canon EF.